I'm trying to update my HTC HD7 from WP7.5 to 7.8 but it keeps returning this error code 80070070 "We cant update your phone because your phone or your computer is running low space. Try freeing some space from your phone or your computer and then try installing the update". I've tried replacing the microSD card with 32Gb, erased everything, changed the reserve space but still have the same issue. After searching online I've heard it could be an issue with the radio software version. The current version is 5.51.09.11a_22.31.50.09U. Will flashing the radio software to 5.71.09.02a_22.51.50.21U remedy this issue? 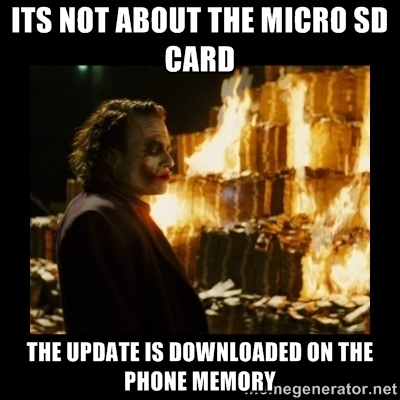 Its not about the SD card, the internal memory is where the phone downloads its updates. I also tried hard reset but the same error occurs. Last edited by Netloader; 10-19-2013 at 09:18 AM. Maths was really not my field of expertise, I still cannot add 2 + 2, make sure your phone has atleast 1.5GB? free space after you remove the card. The phone was purchased new. I've contacted the seller and they've agreed to update it for me once I ship the phone back. Hope they can resolve the issue -- they seemed confident. AT&T Amber Update Installed, but None of the Features have been added? any one update to gdr3 in 520!! Is this happening to anyone else (font sharpness) [8.1]?